This would require him getting off the rebar, fighting his way through a horde and saving his friends before he dies in some epic way that is hopefully better and more memorable than what we saw with Madison on Fear the Walking Dead . This feels like it would be the most “fitting” end for his character, a heroic sacrifice, but possibly also the most predictable, so perhaps this won’t happen and we’ll get some sort of a curveball. A walker version of Rick would be the most haunting, harrowing image in the show’s history, and would be a bit of a bookend with Shane. This…seems a little heavy for The Walking Dead if you ask me, and I’d be pretty surprised if we see Walker Rick before the night is out, where Daryl or Michonne is forced to kill him. We have learned in recent episode that this mystery group is trading Jadis supplies for “As and Bs,” different types of people that are right now by best guess, leaders and followers. 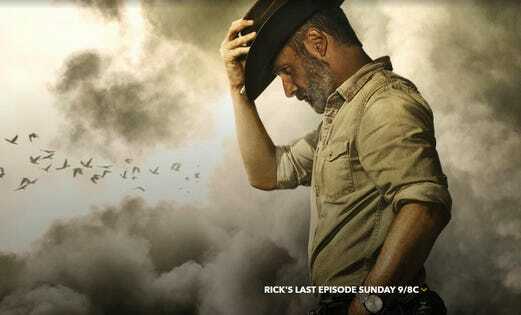 If B) no one saw Rick taken, then he would simply disappear like Glenn was going to during his fake death, which doesn’t make much narrative sense, and everyone would still be looking for him.